As a society, we talk a lot about balance. We're looking for personal balance, striving to maintain work-life balance, trying to eat balanced meals, and on and on. The photos that seem to go with "balance" are either of serene, willowy women, dressed in all white, with straight-but-bouncy hair or stones balanced precariously on one another. Maybe balance comes easily if you're willowy and can wear white serenely while you find the balance points of oddly-shaped stones. I wouldn't know. For me, balance requires constant adjustments, some of which are really challenging to make. Recently, I wondered if I could just take a longer view and assess balance over a couple of months, rather than daily or even weekly. You know, ease-up a little bit on the routine, spend more time on certain things (writing), less on others (cooking and exercise), maybe it would all average out. Guess what? It doesn't. Just ask my too-tight dress and snapped-at husband. So three weeks ago, I made some changes, re-established a routine, quit skipping lunch half the days of the week, and lo, life is better and my clothes are looser. On the rare days I actually manage to check-off all seven things that "optimize brain matter and create well-being" (focus time, play time, connecting time, physical time, time in, down time, and sleep time) on The Healthy Mind Platter (along with eating the ten cups of vegetables I should), I feel amazing. Most other days, I know I am doing better than I was three weeks ago, so that's okay, too. But then there are days like Sunday, which was Mother's Day, when everything goes gloriously out of whack. Like lots of women, I have my own misgivings about the holiday, but they all took a back seat to Wyatt's excitement on Sunday morning. Marc and he made breakfast, and I wasn't allowed out of bed until it was ready. And Wyatt might have exploded if he had to wait even one more second to give me the presents he had made at school: a silk scarf he had painted into a rainbow ("Look! I made that lime green!") and then ironed, and a drawing of flowers in the sun. Also, I drank at least a half a bottle of pink champagne with take-out for dinner. It was a relaxing end to a fun day visiting the newly renovated and expanded SF MOMA. Most of the balance I experienced on Sunday was in the form of incredible artwork and architecture. And if I'm honest, I would have really enjoyed being able to linger in ANY gallery for longer than about 90 seconds. But at the same time, it was wonderful to see how Wyatt has begun to appreciate and interact with art. The last time we were at the museum was just before it closed in 2013. 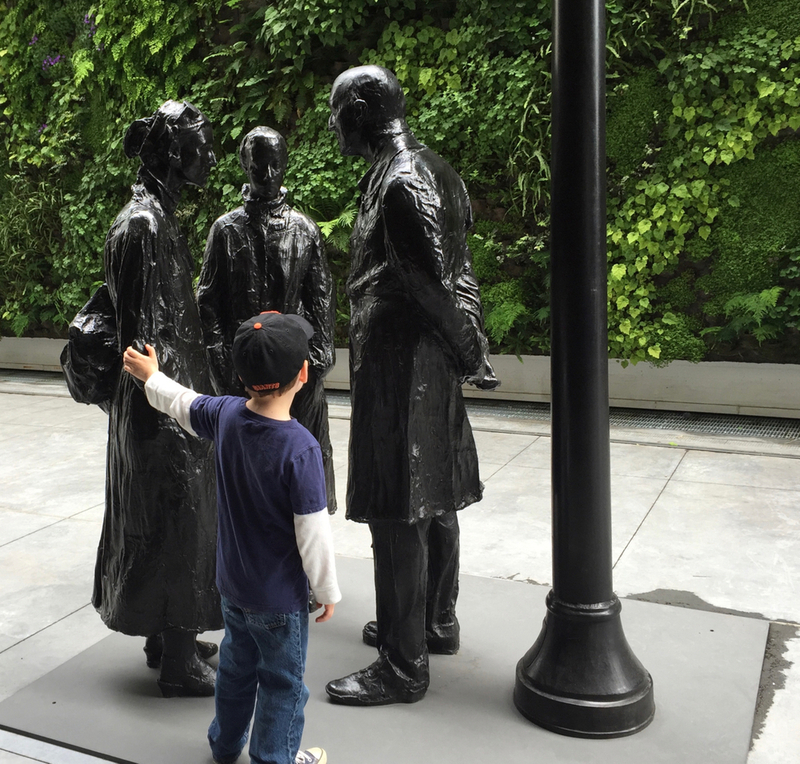 And no surprise, our little builder is far more interested in sculpture these days than paintings, and he's way more intrigued by modern art than the more classical works we saw at the De Young the other week. Even though we hustled through the seven floors of the museum, I was able to get a few photos. The stranger who happened to walk into my photo of Richard Serra's "Sequence" helps to show the scale of the work. We walked through "Sequence" many times and I cannot wait to do it again. Wyatt was perplexed by "Nonsite" (aka The Pile of Dirt), and it was a great way to start talking about what makes something art. I'm a huge sucker for typeface and gradients, so "Fools" also made it into this set. I want to go back and camp out in the Ellsworth Kelly galleries, among other spots. Wyatt and I almost went back to the museum on Monday. But because balance will be mine (whether I want it or not), Wyatt basically collapsed in an exhausted heap after school. There was no getting him out the door in time (or at all) to make our ticket time.